Jean-Paul Peronace started producing hot sauce and chili powers in 2012 for fun and to kick his friends tastebuds. His passion for chilis goes back to the 80's when friends and bullies at school would always asked to get a bite of his sandwich then eating it all on him anyways. So Jean-Paul started using Tabasco or Italian chilis on his sandwich. It took him a few weeks to be able to eat his newly heated up food but his sandwiches were never stolen again.... And the rest is history. So all of us gets to enjoy his creations and I am very happy he created Pot Uno's Infamous Hot sauce! 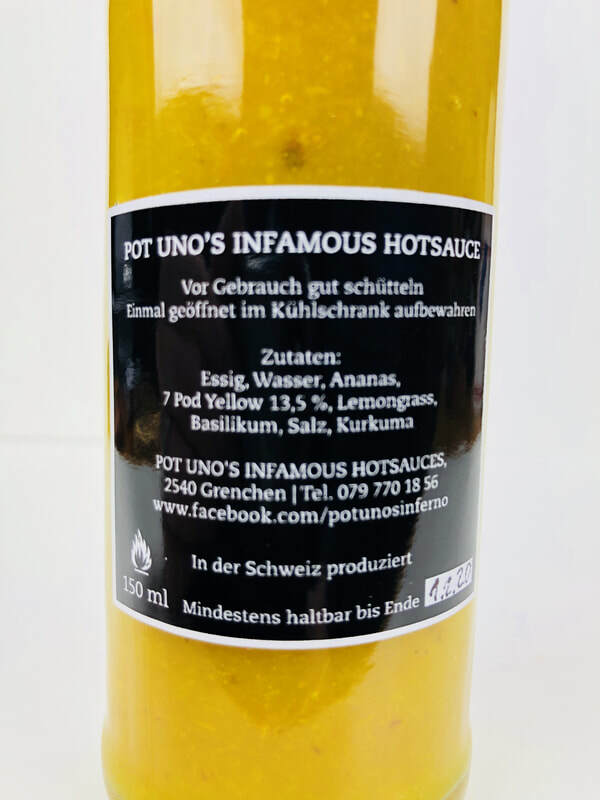 You’ll find hot sauces on the POT UNO'S INFAMOUS HOT SAUCE website, either imported from other countries, summoned from the depth of hell or local SWITZERLAND creations. For the thrill-enthusiasts, All their tasty chili sauces will fit perfectly whit your various meals. From pizza to tacos, all the way through veggies, chicken, BBQ’s and even cocktails. The pain aficionados will even be to challenge themselves in the “extreme” category, with sauces so hot the spice become unbearable. On Hotsauce, you’ll find hot sauce, buffalo sauce and barbecue sauce as well as my other spicy surprises. Created out of jalapeno, habanero, serrano, naga, espelette pepper, tabasco peppers an many others. Get your spicy recipes quicly delivered at home, or find it in restaurants, shops, and numerous events and spicy parties. 100.- and plus deliveries are free in Switzerland. 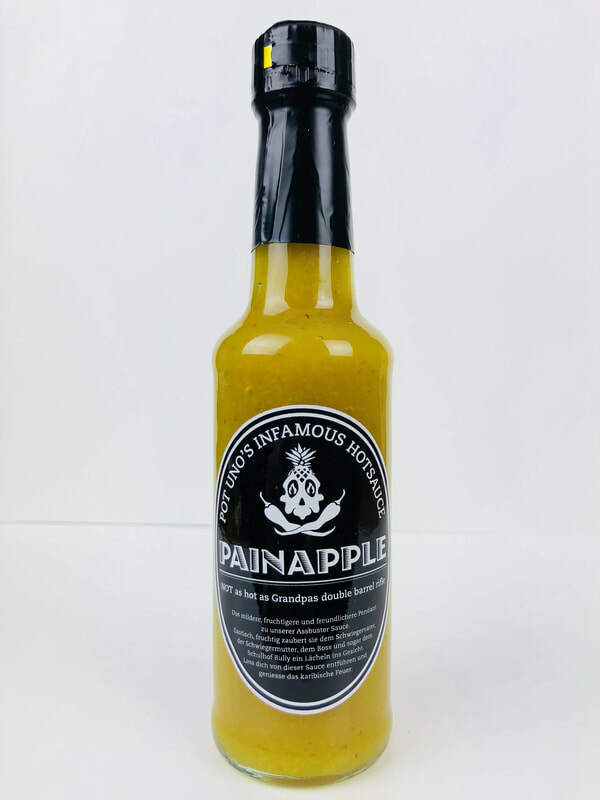 PAINAPPLE from POT UNO'S INFAMOUS HOTSAUCE.. Paninapple is the perfect name for this sauce because the sizzling pineapple flavor burns so good from the tip of your tongue all the way down your throat coming from the heat of the 7 pot yellow chili. There is a slight sweetness from the pineapple, but what really makes this sauce pop is the added flavor from lemongrass, basil and Turmeric. All of these flavors brings an amazing unique taste I'm sure you will love. This is a vinegar forward hot sauce so I loved it on shrimp and fish tacos. This is also amazing on pork with dirty rice and beans. I even loved putting a few drops on cottage cheese to give it a nice little kick. Definitely check out this wonderful pineapple treat on your next meal all the way from Switzerland. 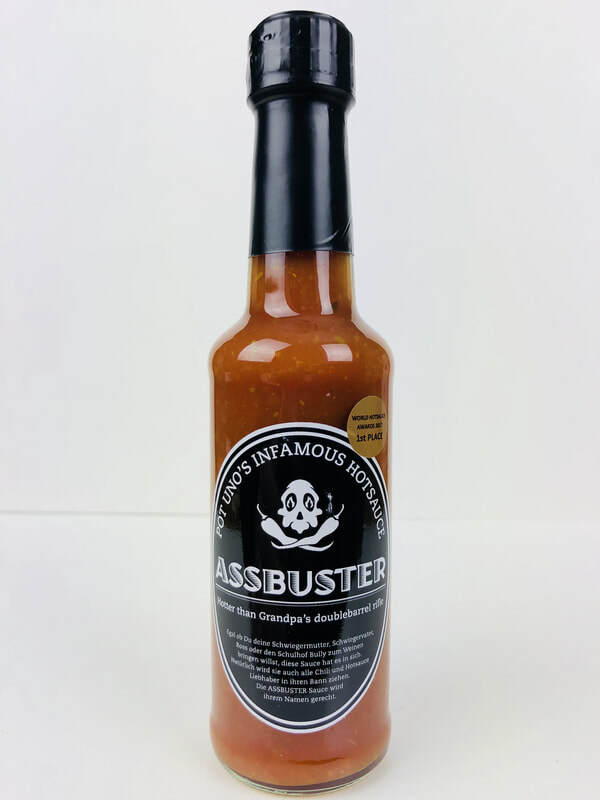 ASSBUSTER from POT UNO'S INFAMOUS HOTSAUCE.. All the way from Switzerland comes a very hot and delicious tasting hot sauce with lots of flavor. Made from the need to keep other school kids from eating his sandwichs, Jean-Paul adding chilis or store bought hot sauce and learned to love the heat and flavor it added to his food. And so, Jean-Paul decided to make his own brand. 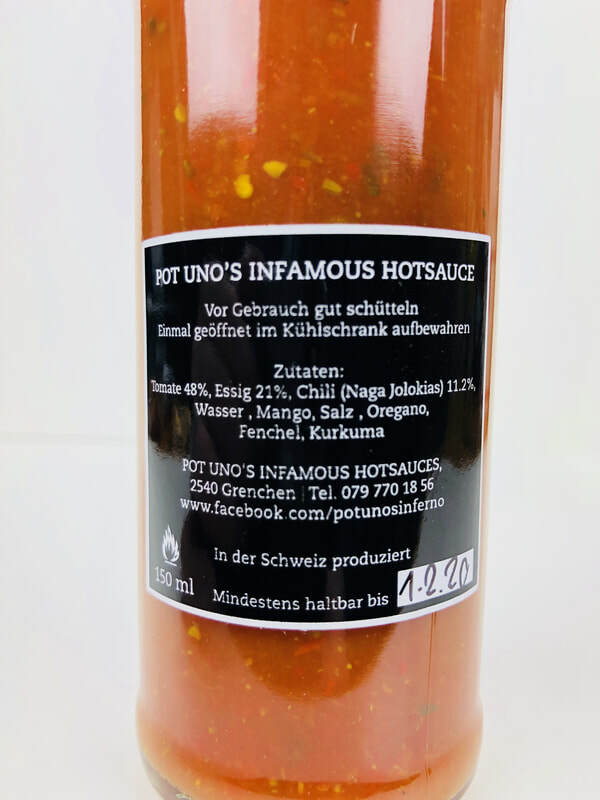 With tomato, vinegar, Naga Molokai chili, water, mango, salt, oregano, fenel and Tumeric, these ingredients make this a tasty hot sauce that will light up your taste buds with it's extreme heat. The flavor of the Naga Jolokis is right out front but you definitely get the tomato, vinerar and mango in there. I loved this on pizza and omelettes but this sauce will go with just about any food. I’m going to make a hot wing sauce by cooking it down to make it thick and sticky. The great flavor makes you want to add more, but do it with caution because IT IS HOT! The more you eat, the hotter it gets. MY PEE BURNS from POT UNO'S INFAMOUS HOTSAUCE.. Here's a chili powded that's a great alternative to red pepper flakes. 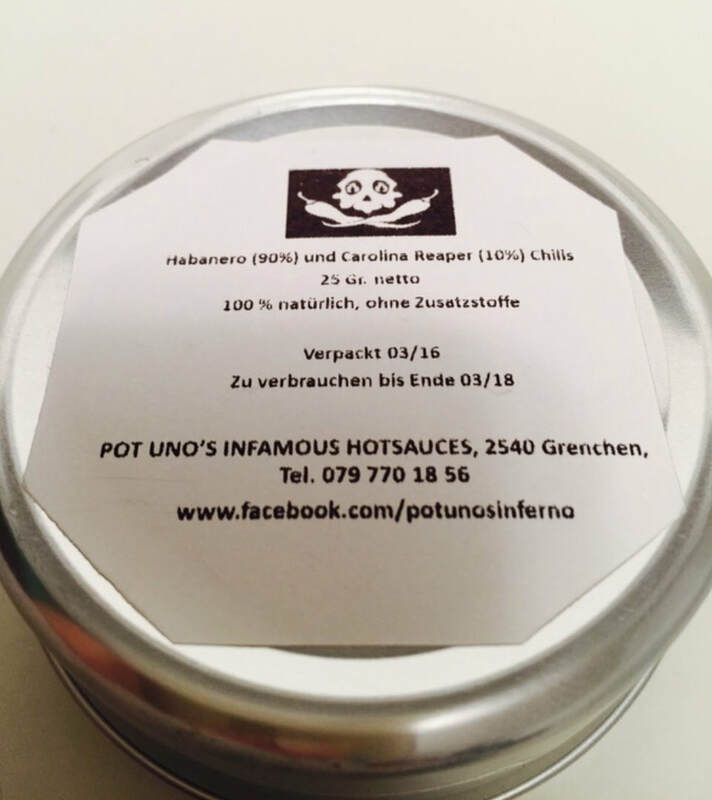 If you want to add some heat to your food and a little bit of true pepper taste, then here's a fantastic idea from Pot Uno. 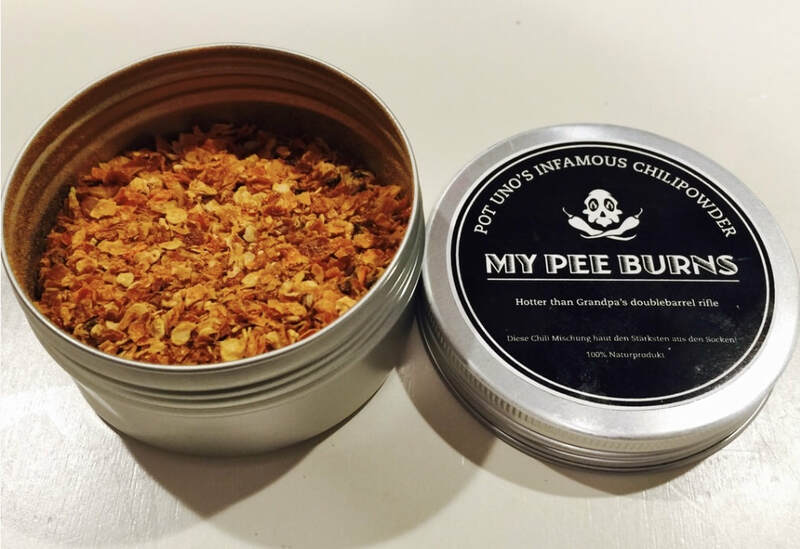 MY PEE BURNS is a mixture of two different peppers, 90% habanero and 10% Carolina Reaper. As you can guess, this is very hot and has a nice strong pepper taste. You will find many uses for this in your quest to spice up your food! 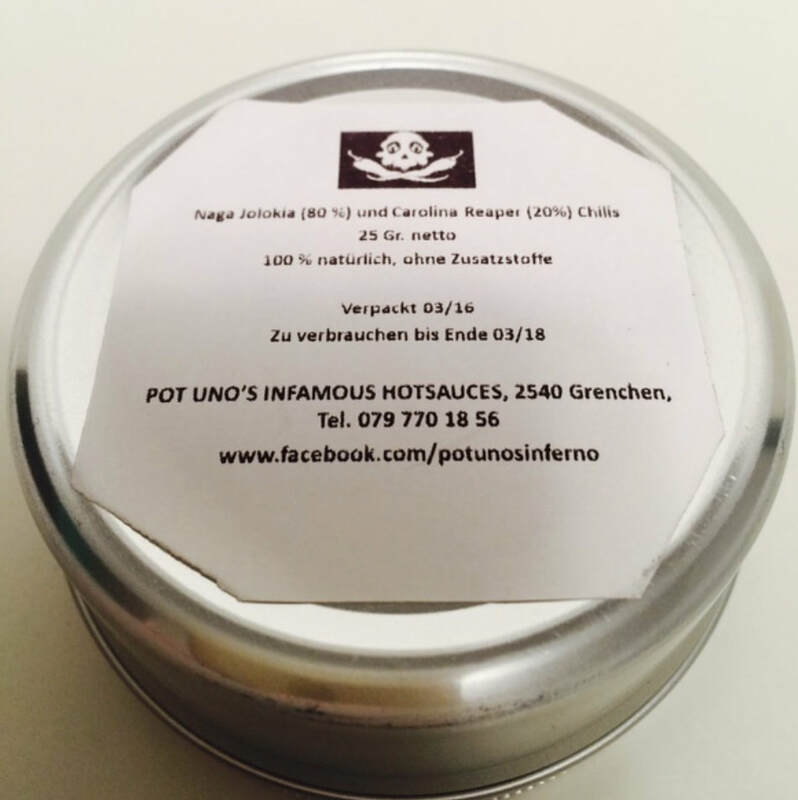 BRING THE PAIN from POT UNO'S INFAMOUS HOTSAUCE.. 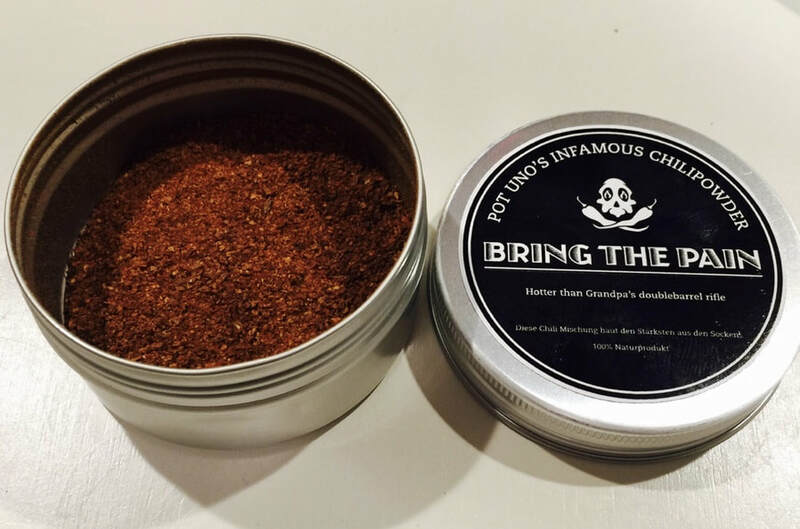 It's just like My Pee Burns, but Bring The Pain is a tasty mixture of dried and crushed hot peppers of 80% Naga Jolokia and 20% Carolina Reaper. This powder would also be a great alternative to red pepper flakes. And as you can guess, this one is also very hot with an awesome true pepper taste that would be great on just about anything. Add it to chili, soups or any food you want to bring the heat!